I’m starting a new series discussing the effects of the wings and how best to prepare for them as each Naxxramas wing drops into play. WARNING: majority of information over here is taken from leaked posts and images which seem very trustworthy. It is still possible for changes to be made between now and then, but consider this ‘spoiling’ the experience of finding out the Naxx adventure, and the meta, yourself. Be warned. 1) Rogues! Your fight, as you might have guessed, is with the mighty Anub Rekhan, undead spider lord of Nerub! Nerubians will be a plenty with this armored titan, and for your reward, you will gain your own Nerubian, the Anubar Ambusher! 2) Druids! 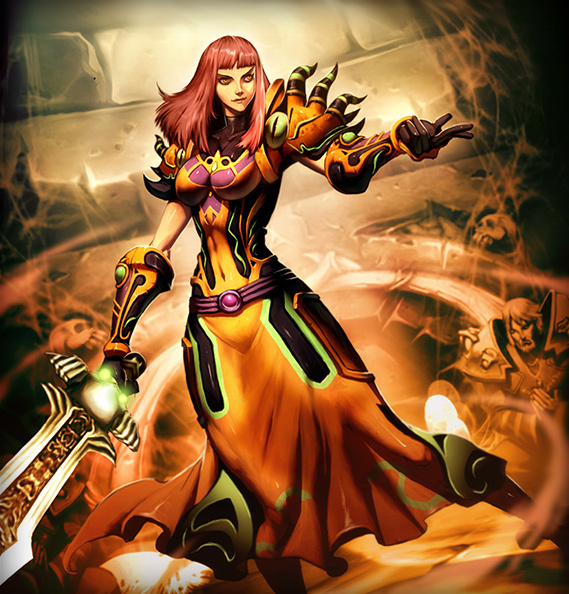 You will face the Grand Widow Faerlina in an epic battle to get your card, the Poison Seeds. How fitting considering the Widow is a master of poisons herself! Your unique deck will consist of 1/4 Gargoyles that will heal themselves to full at the start of your turn. Consider this card to be released as a neutral in Naxx. 3) Hunters! YOU WON’T GET YOUR CLASS CHALLENGE AND SPIDER MINION IN THIS FIRST WING. You get your spiders in the next wing, because your class challenge is with Loatheb, the Plague Quarter’s final boss! (I know, seems weird to me too that you get your spider minion later). But do not fret! Because your class challenge is the most fun of them all and is coming in the second wing! Stay tuned. FINAL BOSS: Maexxna – Guess where the Grand Widow gets her poisons from? Yep, Maexxna. 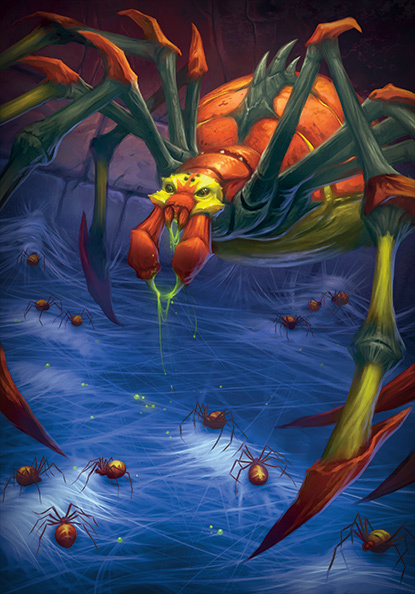 This behemoth of a spider births spider lings for use by Kel Thuzad and his sinister experiments. Tread lightly. Your legendary reward for beating Maexxna is Maexxna herself! And she is just broken! 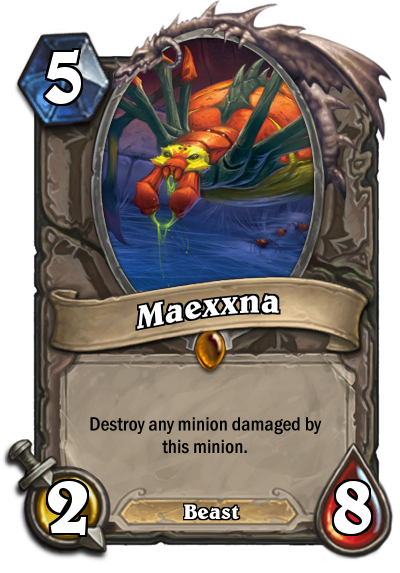 Maexxna (5 mana, 2/8): Destroy any minion damaged by Maexxna. Beast. Other neutral cards (besides the Gargoyle) are ‘Nerubian Egg’ which we have all seen, and a 2 mana 2/1 spider (beast) that upon death becomes two 1/1 spiders. There are more coming too. Rogues and Druids get their cards first! For Druids at least, Miracle just became a bit easier because there is a counter to a stealthed Rogue, AND the card can be used to level a board full of giants in a Handlock match. Poison seeds however CAN be countered by a skilled opponent even with those effects (Rogues – cycle as much as possible using stealth and use the minion to your advantage with Cold Blood. Handlocks – don’t commit too much and carefully plan your board). Expect the new class cards in all of your games – every single player will be dying to try them out. For Rogues, their tempo deck just became a bit better. A 5/5 for 4 puts pressure, and this could be a decent minion for Miracle too. 5/5s are hard to remove. The neutrals are a bit scarier. Keep in mind that all spiders are considered Beasts, so Hunter and Aggro have some really nice toys to play with. Watch out for Nerubian Egg which will see a ton of play. That 2/1 spider is no joke – a cunning Hunter can set up two card draws with the Buzzard. The Gargoyles seem interesting but without knowing their mana cost, we won’t know how effective they will be. What should you be scared of? That’s right, Maexxna. It’s a 2/8 Emperor Cobra for 5 mana. That is INSANE. Every class now has gotten a really powerful neutral 5 drop, and Hunter Mid Range got something incredibly powerful to combo with Hound Master. Maexxna herself is the best answer to Druid Mid Range threats (Maexxna eats two DotCs by herself!). You will now NEED to bring in your Stampeding Kodos to take down Maexxna, so don’t skimp out on them! Paladins, keep your Kodos in! Priests, make sure you save your Shadow of Pain for this spider! For now at least, having Kodos is going to be the new norm in Naxx – many minions have a trend of low attack, high health (the Four Horseman, like Baron Rivendare are 1/7). If not taking down quickly, they will overrun your board. Silences won’t hurt, but be warned that we don’t have good silence minions in this game (apart from class minions like Druid’s KotG). There are many decks floating around on the major deck building sites that have these new Naxx cards included – go through them and see what other people are thinking, and check out the discussion threads on all the neutral and class cards discussed so far. All will educate you on how best to deal with this new meta. Keep in mind that with more and more wings coming, and this season of July ending, there will be a power vacuum in August. The best deck to climb in August will be the one to make best use of the new cards and how to counter them. Understand your new cards, and believe in them. They will serve you well.